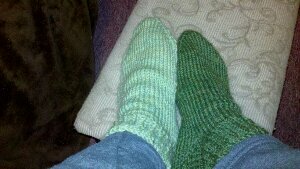 A few weeks ago I had a fit of ambition and decided to learn to knit 2-at-a-time toe-up socks. I found them shockingly easy. They’re sloppy and ugly and they don’t fit, because I didn’t have the tips to go down my more typical couple-of-needle-sizes. They’re made from Cascade 220 and I’ll probably wash them accidentally at some point. But you know what? I feel really freaking awesome right now. This entry was posted in Knitting on October 25, 2011 by deb.